The SR20DET is part of the SR family of engines from Nissan. It is a popular inline four cylinder engine fitted into a variety of cars, generally the Nissan Silvia and 180SX. It also came in the Pulsar GTI-R, Nissan NX Coupe and the Nissan Bluebird. This engine replaced the CA18DE and CA18DET that originally powered the Silvia and 180SX. The CA18 was deemed too expensive to produce and no longer met Japanese emission standards, so it was replaced by the SR20. The SR, just like the out-going CA, was a turbocharged intercooled engine in top form. Nissan also produced a cheaper naturally aspirated version called the SR20DE. In the US and Canada, the Silvia and 180SX are both under the 240SX banner. USDM and Canada 240SX's come stock with the SOHC KA24E for earlier models, or the DOHC KA24DE for later models. Both are naturally aspirated engines producing 140 hp (100 kW) and 155 hp (116 kW) respectively. SR20DET engine swaps are becoming more commonplace due to the forced induction aftermarket additions available for the SR20DET. Many shops specialize only in SR20DET swaps. 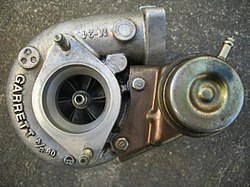 The Garrett T25 turbo used on most SR20DET engines. The Lack of the letter "D" on some of the engine identifications indicates a SOHC cylinder head. The SR20DET was first produced in the Nissan Bluebird 2000SSS in transverse form. However the RWD Nissan Silvia and Nissan 180SX produced in 1991 were built with a longitudinally aligned SR20DET, in which the "T" stands for turbo. Some of the 180SX's were released with the SR20DET while others had the naturally aspirated SR20DE. Out of all the Nissan models produced with the SR20DET, the Silvia was the longest running model to use it. The S14 and S15 use a bigger turbocharger than the S13 models. S13 Red top - Came from S13 Silvia and 180sx pre 94 (Garrett T25G turbo) 370cc injectors were used. S14 Black top - 91-98 Silvias - Variable Cam Timing or VCT was introduced on the intake cam (Garrett T28 journal bearing turbo for Australian and European markets and Garrett T28 Ball Bearing turbo for the Japanese market) 370cc injectors were used. Wikimedia Commons has media related to Nissan SR20DET engine. This page was last edited on 3 February 2019, at 04:31 (UTC).